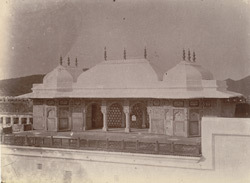 Photograph of the Sohag Mandir Pavilion, the second storey of the Ganesh Pol, from the rear at Amber Palace taken sometime in the 1880s and attributed to Henry Hardy Cole (probably incorrectly). The palace at Amber was begun by Raja Man Singh circa 1600, with alterations continuing throughout the seventeenth century and beyond, until the fort was finally abandoned in 1727. The Ganesh Pol is so-called because of its painted panel of the god Ganesha above the entrance arch. The front of the Sohag Mandir has three archways of pierced marble, or jali-work, placed above the the main archway of the Ganesh Pol which allowed the ladies of the court to observe events below without being seen.